While people from Corpus Christi to Houston are still dealing with the aftermath of Hurricane Harvey, two more storms showed up in the Atlantic. Hurricane Irma formed in the mid-Atlantic and strengthened to Category 5 by September 5, 2017; max winds 160 KT (185 mph). Now, it’s on the doorstep of the Leeward Islands. Tropical Storm Jose formed yesterday in the mid-Atlantic. [UPDATE 09-06-2017] Tropical Storm Katia formed overnight in the Gulf of Mexico about 105 miles east of Tampico, Mexico. It is not expected to impact the U.S.
[UPDATE 09-07-2017] Tropical Storm Jose strengthened to Hurricane Jose overnight, and Tropical Storm Katia strengthened to Hurricane Katia overnight. Hurricane Jose is following a similar path to Hurricane Irma, but it’s expected to turn north sooner than Irma and not affect Florida. Florida is preparing for a strong Hurricane Irma; possibly Category 4. Hurricane Katia is still not expected to impact the U.S.
MAX SUSTAINED WINDS 150 KT WITH GUSTS TO 185 KT. MAX SUSTAINED WINDS 80 KT WITH GUSTS TO 100 KT. 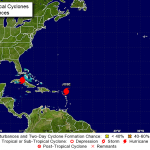 [UPDATE 09-08-2017] In the past 12 hours, Hurricane Irma weakened to Category 4, Hurricane Jose strengthened to Category 4, and Hurricane Katia strengthened to Category 2. Hurricane Irma is located between Cuba and the Bahamas, and is expected to make landfall in south Florida on Sunday morning. Hurricane Jose is on a path to skim the northern Leeward Islands and continue a northerly course towards Bermuda. Hurricane Katia is expected to make landfall north of Veracruz, Mexico, late Friday night. MAX SUSTAINED WINDS 130 KT WITH GUSTS TO 160 KT. MAX SUSTAINED WINDS 85 KT WITH GUSTS TO 105 KT. [UPDATE 09-09-2017] Last night Hurricane Katia made landfall north of Tecolutla, Mexico and quickly fell apart. Hurricane Irma, weakened to a Category 3 (but expected to restrengthen), slowly continued its northwest track toward south Florida. Irma is located just off of the north coast of Cuba. Hurricane Jose, still a Category 4, slowly continued its northwest track. Jose is located about 50 miles northeast of Barbuda Island. MAX SUSTAINED WINDS 110 KT WITH GUSTS TO 135 KT. MAX SUSTAINED WINDS 125 KT WITH GUSTS TO 150 KT. [UPDATE 09-10-2017] Overnight Hurricane Irma, Category 4, turned north and made first landfall on the lower Florida Keys. It is continuing on a northerly course. Hurricane Jose, still a Category 4, slowly continued its northwest track. It is located 180 miles north of Puerto Rico. [UPDATE 09-11-2017] The past 24 hours Hurricane Irma moved 400 miles north and was down graded to a Tropical Storm. TS Irma is located 30 miles west of Gainesville, Florida. Hurricane Jose was down graded to Category 2. 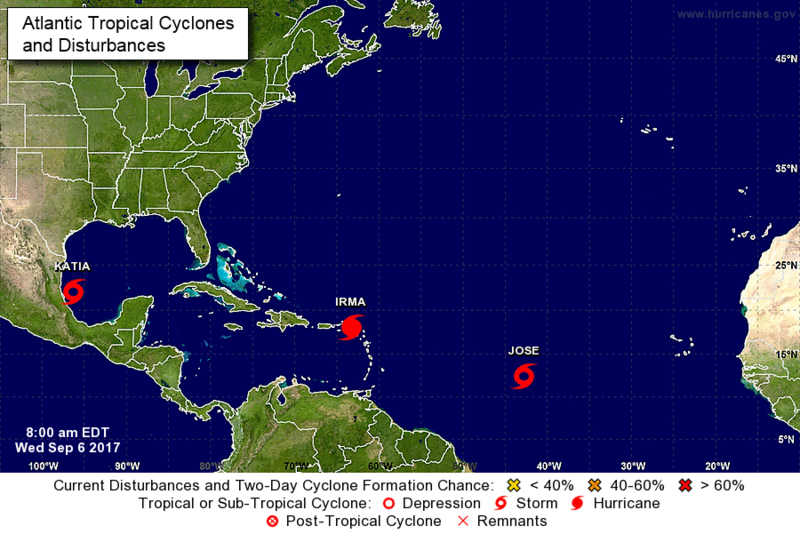 Jose is located about 550 miles east of Nassau, Bahamas. MAX SUSTAINED WINDS 90 KT WITH GUSTS TO 110 KT. [UPDATE 09-12-2017] In the past 24 hours Hurricane Irma moved north to the Alabama-Georgia line and weakened to a post-cyclone. Hurricane Jose weakened to Category 1. It’s located 400 miles southwest from Bermuda. MAX SUSTAINED WINDS 65 KT WITH GUSTS TO 80 KT.